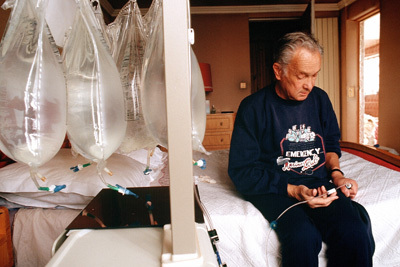 Peritoneal dialysis may offer elderly patients greater independence. Increased levels of serum phosphate and calcium-phosphate product at the start of peritoneal dialysis (PD) are associated with higher death risks. Of 1662 Chinese patients (mean age: 47 years; 59% male; 24% with diabetes) initiating PD as their first dialysis modality, 382 (23%) died within 38 months. Serum phosphate levels higher than 1.78 mmol/L and calcium-phosphate product values exceeding 4.4 mmol2/L2 were associated with significant 1.8- and 2.1-fold increased risks of all-cause and cardiovascular mortality, respectively. The risk for death, however, decreased 14.3% for each 1 mmol/L increase in albumin-corrected calcium at baseline, Xiao Yang, PhD, MD, of the First Affiliated Hospital, Sun Yat-sen University, Guangzhou, Guangdong, China, and colleagues reported online in Nephrology. “These findings provide important information for the management of serum calcium levels in CKD patients,” Dr Yang and the team stated. They noted that the 2017 update of the chronic kidney disease-mineral bone disease guideline from the Kidney Disease: Improving Global Outcomes (KDIGO) initiative stated that calcitriol and vitamin D analogues should not routinely used in patients with adult CKD G3a–G5 without dialysis. “Although there is no conclusive clinical evidence demonstrating the impact of lowering serum calcium levels on outcomes for end-stage renal disease patients, maintaining serum calcium levels within the 2.10-2.37 mmol/L range may be beneficial for patient-level outcomes,” Dr Yang and colleagues wrote. The authors acknowledged that fibroblast growth factor-23 was not measured, which is a study limitation.